I’m not sure what’s more amazing to me – Evan Lysacek’s gold medal skating routine, or the fact that this video is still available on YouTube! The IOC (International Olympic Committee) has been very aggressive about bringing down “event” videos from YouTube. But Evan Lysacek’s gold medal performance is still available (at as of right now). 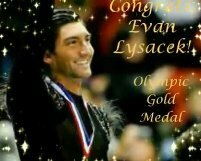 With a beautifully-executed Olympic freeskate program, World Champion Evan Lysacek of the United States took home the first American gold medal in over 20 years! Here is his amazing freeskate from the 2009 World Championship set to Adam Lambert’s “Time for Miracles.” Congratulations, Evan! That's not his Olympic routine. That's his 2009 winning routine. Hi Mara – thanks for pointing that out! I will put a link to the CBS site since apparently this is the one and only place on the web you can watch any video related to the Olympics. I've never seen such an aggressive lock down of content before than the Olympics. If you want to see Evan’s sp and fs that he skated at the Olympics, , you can YouTube the Grand Prix Final 2009 series where he tried out his Olympic routines…Stravinsky’s Firebird..and Sheherazade, by Rimsky-Korsakov.